Carol Jean Vigil, the first American Indian to be elected as a state judge in New Mexico and the first Indian in the U.S. to be elected as a judge of a general jurisdiction court, died Friday at Tesuque Pueblo. She was 61. 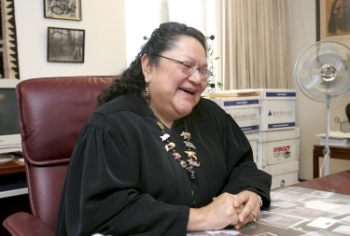 When Vigil was sworn in as a 1st Judicial District judge in 1998, she wore a black robe with beaded Pueblo Indian symbols of mountains, lightning, clouds and rain embroidered on the shoulders. "She was very serious about her work, really concerned about getting it right," said Santa Fe attorney Bryant Rogers, who served as her treasurer in that election. On the bench, he said, she was "very thoughtful and well prepared." Vigil called it like she read it, he added. Her decision upholding state court jurisdiction over tort claims for personal injury filed by patrons of tribal gaming operations was hotly disputed. All the pueblos were on the other side. "She did what she thought was right and she was ultimately upheld by the state Supreme Court," he said. Vigil got both her bachelor's and law degrees (1977) from The University of New Mexico. After passing the bar � the first Pueblo Indian woman to be admitted � she went to work for Indian Pueblo Legal Services Inc. According to her husband of 31 years, Philip Palmer, she served as assistant attorney general under Jeff Bingaman and in the mid-1980s went into private practice. She served as a tribal lawyer for Tesuque Pueblo, he said, and wrote the tribal codes for Tesuque and Taos pueblos. In 1988, Vigil was hired by the 1st Judicial District to be a child support hearing officer. In 1994, she was named special commissioner for domestic violence and mental competency. "She spent an enormous amount of time protecting children. That was real important to her," Rogers said. In fact, he said, her dedication to making parents pay child support due to their children drew the attention of the sheriff, who visited her office one day to inform her that she had put "more people in the Santa Fe County jail than the district attorney." In 1995, The New Mexican named Vigil one of the 10 Who Made a Difference. Vigil retired from District Court in 2005. Before having trouble with her knees, she enjoyed an annual elk hunt. And according to Palmer, his wife liked the outdoors, especially camping and fishing. And recently she had returned to her love of making pencil drawings and paintings. In addition to her husband, Vigil is survived by her mother, Evelyn Vigil; a daughter, Sparo Arica Vigil; and a brother, Martin Vigil, a deputy county fire chief. Services are pending. She seems like a reasonable and fair judge. I am sure her family and community will miss her. Very sad. Thank you Kat. My sympathies to her family, and the community, as she will be missed. Hopefully, there is another woman standing in the wings...to take her place! Noted, Thank you, Kat. Noted Kat and I echo the feelings expressed here already. Noted Kat. My condolences to her family and community as well. What a great story Kat! I wonder how many there are on the bench now? Will we see anyone follow in her footsteps? I am sure she would be a good role model for a good lawyer to foster her fairness and sense of justice. Rest in peace and may your spirit live long.